Teaching your dog to hold objects in his mouth is possible with patience and consistency. Teaching your dog to hold items in his mouth is a useful trick. 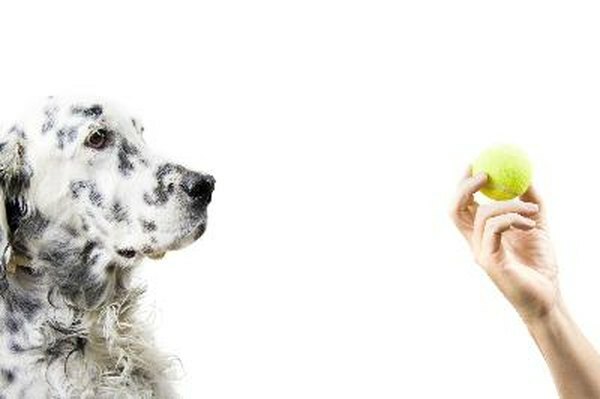 Holding objects without chewing them is important for hunting dogs, obedience competitors and service dogs, and even novice owners can teach this valuable skill. Sit the dog in front of you and allow him to smell the piece of pipe. PVC is an excellent training prop because it is light and smooth, and most dogs do not have a problem picking it up. File off any rough edges to prevent accidental cuts when the dog picks up the pipe. Repeat the process until the dog takes the pipe in his mouth as soon as you give him the “take it” command. Once the pipe is in his mouth, gently scratch the underside of his chin while telling him “hold it.” Not only does the dog enjoy this scratching, it encourages him to hold the pipe in his mouth. Train the dog on the take and hold commands for 10 minutes every day until he is voluntarily grabbing the pipe from your hand. Gradually reduce the amount of peanut butter on the pipe, eliminating it entirely once the dog shows no reluctance to hold the pipe. Introduce new objects once the dog is consistently holding the pipe. Any type of lightweight object is acceptable, including pencils, leashes and water bottles. Pick objects according to the size of your dog’s mouth to prevent injuries. Some dogs will learn to hold objects in just a few sessions, while others may take months to learn this skill. Stay patient and work with the dog consistently for best results. Youtube: Dog Training Tutorial: Holding Objects & Clean Up!